Jed-Forest have been granted a free ticket to the BT Scottish Cup quarter-finals, after Aberdeenshire announced they were withdrawing from the competition. The two sides had been due to meet at Riverside Park on Saturday afternoon but the north easterners have pulled out of the game – and the tournament – because of a large list of injured and unavailable players. With around 12 of their front-row players across the first and second XVs understood to be injured, on holiday or not available, the Granite City squad reckoned they would have to bring in players who were not experienced at National 1 level – and believed there could be an even greater risk of exposing them to serious injury. It was with regret, they said, that the executive committee had decided to inform Jed-Forest and the SRU of its decision to withdraw. Jed-Forest’s head coach, Jammy McFarlane, said he was disappointed the game was not going ahead, as Jed had most of their injured players back and were keen to play. 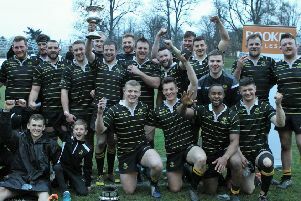 The side also kept its promotion hunt in check last Saturday in BT National League Division I with a fine 44-15 win at home to Hamilton. It was possible, added Jammy, that Jed might use the extra time on Saturday for an additional training session. “You don’t want to lose momentum so, in that respect, it’s difficult having the game off,” he said. “But, by the same token, we have a spot in the last eight of the Scottish Cup, which we’re not having to earn on Saturday – we’ve been given it, and we’ll be excited about who we can draw in that. “We’re only a couple of games away from making the f inal, which would be out of this world . “It’s a competition – we are ambitious and we want to win every competition.